South Bend, IN– A four man group composed of Evan Kuhl, Abner Miralda, Erik Seibt, and Andrew Tursic traveled to South Bend for the Notre Dame University Collegiate Cycling Classic on April 12, 2014. The group participated only in Saturday’s events, the Team Time Trial and the Road Race. 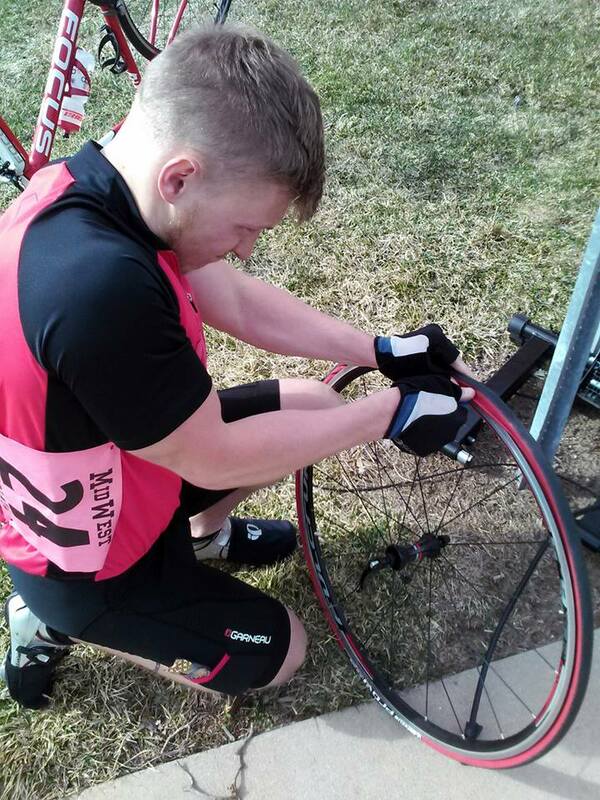 Erik Seibt fixes one of the many flat tires between the RR and TTT at the Notre Dame Cycling Classic on Saturday April 12, 2014. Starting at the Green Township Community Center, the Team Time Trial featured a four-turn 12km circuit that featured minor elevation changes, chip-and-seal roads, and gusty wind conditions. Prior to the start, serveral reports came through that shoe tacks had been found on course around the 4km mark. 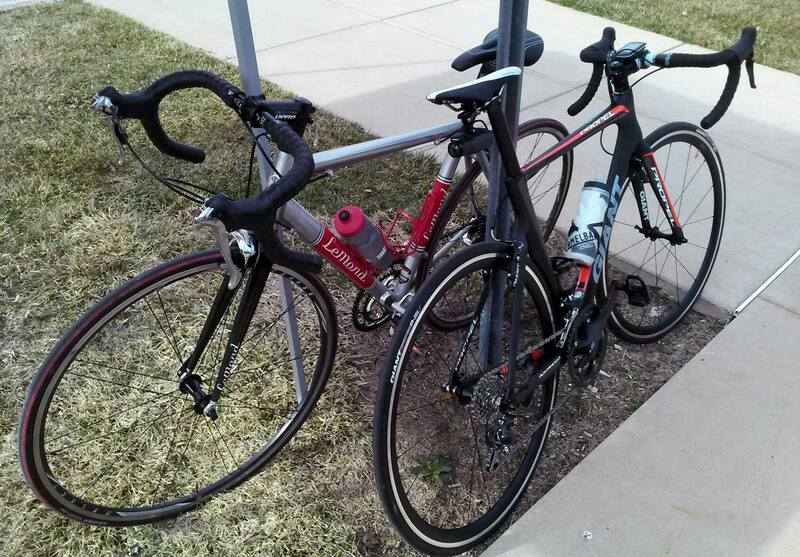 Many riders from multiple schools were forced to abandon the event because of the conditions. Miralda crashed on-course during the TTT, but reported only minor injuries. Seibt recorded a flat tire at the finish line. Despite the setbacks the Men’s D TTT squad faced, they were able to beat the time set by Notre Dame’s D team to claim UofL’s first ever road win. The team’s time of 21:37 stood unbeaten through most of the C class. The Road Race, beginning at the same place as the TTT, toured the Men’s D field of 46 through two laps of a 14-mile loop with varied road conditions, strong winds, and gradual elevation changes. Evan Kuhl was the SCC’s top rider, placing just outside the top 10 in the bunch sprint with a 13th place. Seibt finished 16th, with Tursic and Miralda finishing 29th and 30th respectively. Evan Kuhl rode his brand new Giant Propel from Middletown Fitness and Cycling at the Notre Dame Cycling Classic on Saturday April 12, 2014. -The first Midnight Marathon fun ride will be tonight. Lights/reflectors for visibility and helmets are required. Pre-ride the Derby Marathon Course at midnight and celebrate with a midnight meal at the 24-hr Burger Boy Diner. More info here. -Our very own Evan Kuhl will be running the Boston Marathon this Sunday, April 20th. Our faculty advisor Marion Hambrick will be running this year’s edition of the Kentucky Derby Festival Marathon. Good luck to our marathoners this weekend!